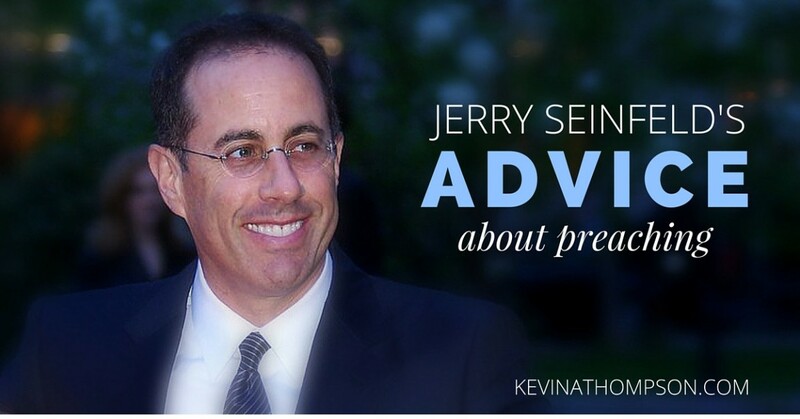 Jerry Seinfeld knows something about preaching. His advice was brought to light during a Twitter back and forth with GQ magazine. Seinfeld, known for his love of wearing jeans, forgot his favorite pair at a hotel. When he arrived in a new town to do his show, he realized his mistake and went to the store to buy a new pair. He posted a picture on Instagram documenting the events. As it is for comedy, so it is for preaching. Cool is preaching poison. Cool is the current trend in preaching. Maybe it’s always been the trend, but it seems especially heightened in today’s culture. It can be tempting for preachers to think that they need to be cool in order to have their message heard. From our school days we learn that the cool kids table is occupied by those whom have a near perfect life. “They’re invincible” is how Echosmith sings about the cool kids, but the perfection and invincibility is a mirage. When preachers seek to be cool, they are attempting to create an image which is not accurate. They are trying to set themselves up as having their lives put together. When a preacher projects coolness, the audience is often left desiring to be like the preacher instead of being like Jesus. There is a better pursuit than cool. The appeal of Jesus was not that he was cool. By no measurement would Jesus have been considered cool. It’s why the powerful of his day were repulsed by him and the outcast were drawn to him. Jesus wasn’t cool; he was real. He was the same in every crowd. He treated everyone fairly. The life he projected was the life he lived. There was no sense of hypocrisy or division. He was real. This should be a pastor’s pursuit. We want to accurately portray ourselves (in our preaching, online, in our day-to-day lives) so that people understand we don’t have our lives together. We should never project a mirage of invincibility, but continually show the true picture of our own struggle to live out a life of faith as fallen people in a fallen world. This doesn’t mean we publicize private things. It is possible to be “too real.” Transparency requires discernment. Some, in the name of realness, have turned preaching into a time of crudeness. That’s not our goal. But genuine realness, in which our audience understands our humanity and sees God’s work in the midst of our brokenness, should be the desire of every preacher. I know Seinfeld’s comedy tip applies to preaching. Cool is preaching poison. When a preacher is seen as cool, they might draw a crowd, but that crowd’s ear for the gospel is lost. Good article. Not that there is anything wrong with it but I hate when preachers don’t preach the whole gospel separating the muffin tops from the stumps. Just like plumbing where different pipes that go to different places, so do a preacher’s sermons. If we could come together like a black and white cookie, we would all be better off. But my number one advice for a preacher is never wear a puffy shirt while being a low talker. This is why I love Community Bible so much. It’s full of uncool people which makes me feel like I belong lol. Kevin, you are the epitome of un-coolness! Who knew that could ever be a compliment! LOL But in all seriousness, I think this is a good lesson for all of us. Jesus didn’t follow the crowd and neither should we. When I first began coming to CBC 10 years ago I was just learning to find myself in all this God stuff. I’m still learning but one thing that has been a huge motivator in my life is that none of you ever portray yourselves as these perfect people. I think there is a huge misconception in this world that people believe pastors have perfect lives because they are “closer” to God than we minions. LOL From my first time at CBC I saw men who did not try to make me believe in a lie of perfectionism. You have been transparent in the fact that you have questions, doubts, concerns, fears and faith struggles just like myself. I was taken aback in a way when I first heard pastors talking about those things because I bought into the lie that pastors are perfect because they are “closer” to God than I am. They don’t have those problems because they are perfect. Then I realized you are humans too, sinners…just like me. And you didn’t hide from that. I felt more comfortable knowing that those thoughts are normal and a big part of my faith now. When those doubts creep in I remember to pray. So thank you for listening to Mr. Seinfeld. Thank you for baring your soul (or most of your soul anyway lol) for the world to see. It’s not a cool soul but I’m ok with that!